Ann Marie O’Dowd is an experienced artist living in the Greater Boston community who specializes in bright acrylic depictions of people, animals, and still lives on canvas. After graduating from Mass Art with a degree in photography, Ann Marie took a hiatus from her artistic career in order to raise her three daughters. After returning to art, Ann Marie shifted her focus from black and white manual photography to acrylic painting. Working from a large supply of black and white photographs from her past, Ann Marie began creating her own colors and patterns to fill these vintage photographs with new life. Over 15 years have passed since Ann Marie began painting, and she is now a well-established artist with exhibits and clients both local and abroad. From billy goats to chihuahua’s, children to adults, Ann Marie brings life to her paintings through unique patterns and a bold and lively palette, creating a telling portrait in every work of art. Ann Marie describes how the physical qualities of both paint, and painting, make the experience and outcome of her work so gratifying. When asked how she came to create her recognizable style Ann Marie states her motto: “it’s only paint!”. A saying which serves as a daily reminder that it is OK to be daring, try new things, and make mistakes with paint. 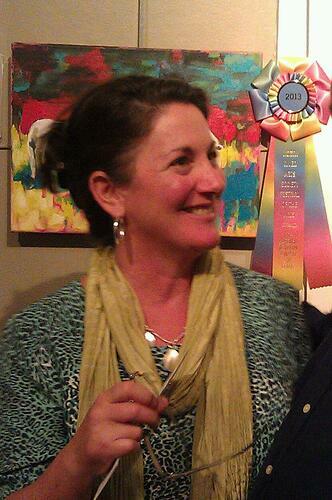 Ann Marie is an active member of the Newton Art Association as well as the North River Art Society and has studied with Zhanna Cantor in Newton, Ma. She enjoys her participation in these communities as it has created close friendships with local artists whom she paints with on a weekly basis out of her home. In addition to exhibitions and private sales of originals and giclee prints, Ann Marie has also been commissioned for corporate projects and events such as her work for Beth Israel Deaconess Medical Center, Massachusetts General Hospital, and the television program This Old House. Most importantly, Ann Marie paints because she loves the physical process of painting, and the gratification of embodying personalities through paint. No matter what the subject, she strives to give every painting the vital elements color and character.